You know, "Monty Python meets Gladiator" certainly has a nice ring to it, and there's no denying that it has definite cover appeal, but in my humble opinion it's not quite right for War God Rising. If I were in charge of marketing Tim Marquitz's latest, I'd have to go with "Monty Python and the Holy Grail A**hole Sword meets A Knight's Tale (minus the foot-tapping musical numbers) by way of a medieval Fish Called Wanda." Sure, it doesn't quite roll off the tongue as nicely, but I can't think of a better way to sum it up. “They attacked me. Vicious, foul demons those creatures were. Vampire sheep." “I have an inkling of one,” she answered, holding her hand up, thumb and forefinger separated by about a half inch. Surprisingly, though, it also works as legitimate heist/con fantasy novel, complete with some solid characters to carry it along. Bess and Kaede make for a fantastic pair of protagonists, playing off one another like the best mismatched, odd couple, road trip buddies imaginable; Mother Calliope and Alvernon are two very different, but very amusing, magical scoundrels with secrets; Sand is absolutely perfect as the dumb-as-dirt sheep boy turned insane-swordsman (with a flatulence issue); and Whineblade may just be the funniest sentient sword in fantasy. There are no heroes here, no paragons of virtue, just a parade of idiots, scoundrels, jerks, and sarcastic jerks who pull the story together. 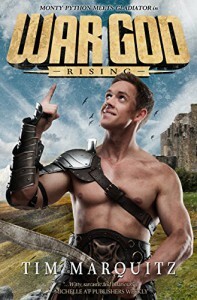 If you're in the mood for a little sophomoric dark humor, over-the-top brutality, sheep jokes, rather imaginative monsters, and a gladiator tournament that actually pays off, then War God Rising is well worth the read. If you don't laugh out loud at least once while reading it, then there's something seriously wrong with you.